Mr. Wilder, Mr. Baxter, and Ms. Kubelik. Magical. That shouldn't be the word that describes a film about a sleazy arrangement that allows executives to use an employee's apartment for lurid affairs. With this in mind, the title The Apartment should bring to mind booze, broads, and unfulfilled promises. Instead, it makes us think of a fragile romance that slowly, achingly enables two people to grow and find happiness. Billy Wilder's movie is beautiful, but it's also cynical, tough, and occasionally cruel. Watching Shirley MacLaine and Jack Lemmon get their hearts broken by the ignorance and the arrogance of others is difficult. Their performances are breathtaking, though, and the script is such a perfect balance between the sweet and the sour -- you'd be a complete idiot to look away for one second. Announcing the Van Johnson Blogathon! Hi, my name's Michaela and I'm a blogathon addict. For the longest time, I was hesitant to host my own blogathon. Now, it's like I can't stop myself. When you have an idea, though, and you're really excited about it and you can't wait to see what other people think, it's hard to not keep doing event after event. You know that quote "Be the change you wish to see in the world"? Well, I say "Create the blogathon you wish to see in the world." I mean, it's basically the same thing. 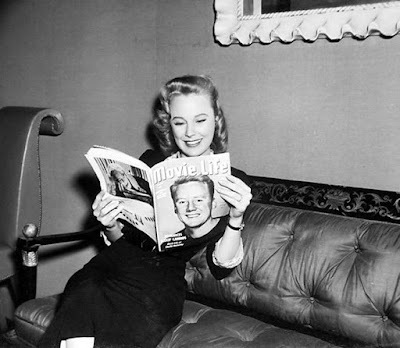 So, although I just announced En Pointe: the Ballet Blogathon with lovely Ms. Christina Wehner, I decided I want to host another event in August... the Van Johnson Blogathon! 8 Classic Films to Watch in Anticipation of Twin Peaks. In less than 24 hours (! 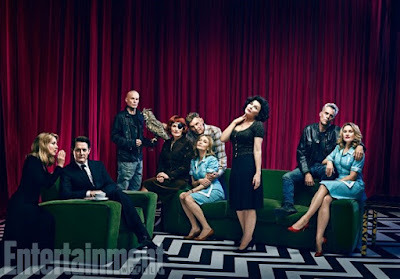 ), the third season of Twin Peaks will be upon us. Two years ago, I spent my winter break cross-stitching and binge-watching David Lynch's stellar TV show and ever since then I've been enamored. I can't imagine being one of those fans who have waited over twenty years for this revival because two years has already seemed like an eternity to me. To celebrate the return of Agent Cooper and the townspeople of Twin Peaks, I've been rewatching the first two seasons but I also thought it might be fun to come up with a list of classic movies that could act as a sort of companion to the show. This was a little tricky since Twin Peaks is pretty singular -- its blend of comedy, horror, melodrama, and murder mystery with a generous dose of the supernatural is not something you're likely to find in Hollywood's Golden Age. But hey, I tried. It's National Classic Movie Day! Although many of us celebrate this every day, it's still nice to declare it a holiday, don't you think? 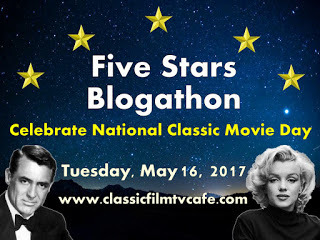 To honor this wonderful occasion, the Classic Film and TV Cafe is hosting the Five Stars Blogathon. Participants must pick their five favorite actors from Hollywood's Golden Age, an idea that sounds great until you have to actually do it. I didn't think I could ever choose just five, but once I started reading other bloggers' posts, I decided I didn't want to miss out on the fun. I'll admit that none of my picks are that surprising. I've talked about these five people so, so much, yet when I started writing this post, they felt like no-brainers. It still hurt my heart to leave out certain people, but what can you do? I'm a pretty cynical person. I'm also not an outwardly affectionate or emotional person. It sounds like I'm a robot, but it is what it is. That being said, there is one thing that will always make me a blubbering mess: a classic film. I seriously stunned my parents one time when they walked into the living room just minutes after I finished Sunrise. I was still crying and I immediately started recounting the whole movie and they legitimately had to ask "Who are you?" 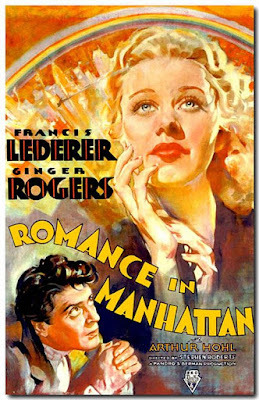 Frank Capra, Charlie Chaplin, and Douglas Sirk frequently make me sob. Greta Garbo, too -- I mean, how many times has that woman tragically died? It's actually insane how many classic films are able to trigger the waterworks for me. Announcing En Pointe: The Ballet Blogathon! Favorite Film and TV Homes Blogathon: Wrap-Up! The Mansion of The Addams Family. The Favorite Film and TV Homes Blogathon is here!